Meet our amazing family of friendly, fully qualified therapists and administration. Next-Gen treat all patients and staff with the same family friendliness. Come on in and say hello! ABOUT: Tom grew up in Tamworth and moved to Newcastle to play soccer at Hunter Sports High. Following some knee injuries he pursued a career in physio and became one of Newcastle’s youngest clinic owners at age 23. WORK: Unrivalled passion and vitality for all things physio. Is known for seeing local soccer players in Newcastle but is equally at home treating mums with bubs, tradies, grandparents and all patients in between. ABOUT: Mikka is a Newcastle boy through and through, a Knights and Jets tragic. He’s from a family full of doctors, nurses and physios, so a passion for looking after the health of others is in his blood. WORK: Having worked at a practice in Maitland for 2-3 years Michael got experience working with kids through to adults, weekend warriors through to athletes, and has experience with all sorts of weird and wacky injuries. He has 6 years of experience working with high level local Rugby, Cricket and for the most part, State League Football sides (Up the Weston Bears!). Working at Next-Gen is hardly work at all when you love what you do and get to work with great people and great patients. PLAY: Sports addict is putting it mildly. If you can win, he’s there. He will challenge you to a game of marbles if there is nothing else to play. Football is his second wife. Mikka loves spending time with friends and family, running and playing with his crazy dog Harvey. ABOUT: Health, outdoors, fitness, adventure. “Remember tomorrow” Has a history in track & field athletics, and more recently Ironman triathlon. Becoming increasingly spiritual. Trying to be a minimalist- yet still a hobbyist and collector of interesting footwear. Enjoys the challenge of a puzzle. Values the contribution I make in the community assisting people to be their best self. WORK: 6th year of Physio: Has been @ Next-Gen since the beginning of 2017, after 3 years of private practice work, and 18months in the hospital system. Loves treating athletes, and non- athletes alike: particularly with endurance sports such as trail running, triathlon, adventure racing. PLAY: Adventures with Jess. Running, fishing, hiking, camping, Dog Ruby. House renos. ABOUT: Sami was born & bred in Newcastle (so loves the beach, sand and sun). Sami is passionate about all things involving movement, health and well-being, from yoga, meditation, clean eating, cross fit, running, and everything in-between. Enthusiastic to help improve the health and lives of others holistically, beyond just our physical health. WORK: Sami has always been heavily involved in the health and fitness world, from being Nationally competitive in Sports Aerobics for 10 years, to being a gymnastic and aerobics coach, is a qualified personal trainer and yoga teacher. Since all of this, Sami has now graduated from University of Newcastle with honours as a Physiotherapist. Her main focus is to incorporate holistic measures to healing and treating any range of athletes and non-athletes, because everyone deserves to move and feel well! Sami looks forward to continuing her journey into holistic health, with a goal to be qualified in practices such as Traditional Chinese Medicine, acupuncture and naturopathy. PLAY: Sami enjoys anything that involves being outdoors in nature, being active and being with friends, or her little white sassy dog Pipsi. Yoga, beach, hiking, getting sweaty in the gym, running out in nature, everything! Sami has a strong belief that quality nutritious food can taste good, so she enjoys creating nutrition packed plant-based creations (including her special handmade raw vegan chocolate). Want to make friends with Sami? Bring her a kombucha, herbal tea, some organic produce or recycled enviro-friendly anything and your set! ABOUT: Born in Tamworth but made the move to Newcastle 3 years ago and absolutely loves it. Passionate dog lover with her fur baby Darcie being a big part of the family. PLAY: Loves spending time with her boyfriend Blair and dog Darcie in the outdoors adventuring and camping. Passion for food and cooking whilst enjoying a nice glass of red. ABOUT: Born and raised in Newcastle. Adam grew up in Redhead so naturally he has a love of the ocean and being outdoors. He went to Redhead Primary School and Whitebridge High School. Spending time with family and friends is important to him. WORK: Adam took a gap year after school, then his passion for helping people lead him to Newcastle TAFE where he studied Diploma of Remedial Massage. Since then he has studied numerous different courses including Dry Needling and another Diploma in Myofascial Release. He has studied Yoga in Australia as well as abroad in India. Currently he has just begun his University degree at Newcastle studying Bachelor of Arts / Science with aims to get into Physiotherapy next year. ABOUT: April grew up Newcastle and spent most of her childhood at the beach so naturally she loves the sunshine and being outdoors. WORK: April has been working as a receptionist at Next-Gen since 2016 and loves her Next-Gen family! Her passion for Sports and the outdoors lead her to studying a Degree in Exercise and Sports Science which she is loving! (most of the time). ABOUT: Sophie grew up in the Hunter Valley, she has two younger sisters and a cavoodle named Maggie who is also like a member of the family. An avid online shopper, although Sophie hasn’t been here for long the postman already knows her on a first name basis. WORK: With almost 10 years’ experience in the administrative field it has always been Sophie’s goal to become a Practice Manager. A lover of all things structure and organisation this role is the perfect fit looking after everyone and everything at the clinic. Sophie has even been given the nickname of Mum at Next-Gen. PLAY: Loves everything about food; cooking it, eating it, watching tv shows about it. Sophie also enjoys spending time with her partner Tom (not Russell), and is impartial to a nice glass of wine and a night out with her friends. ABOUT: Animal lover, heavy lifter, meditation enthusiast. Born in Wollongong, but early on moved to and raised in Newcastle. Despite having family from all corners of the globe she believes Newcastle is one of the best places in the whole world. Married her English hubby (Liam) in April 2016 and living life to the fullest alongside 2 rescue greyhounds (or 80km/hr couch potatoes as they should be known) that take up all the space on the lounge. WORK: Kim has been working as a Personal Trainer since 2015 and currently trains her clients at a PT studio in Cardiff. She loves the process of getting fit & strong to transform lives. 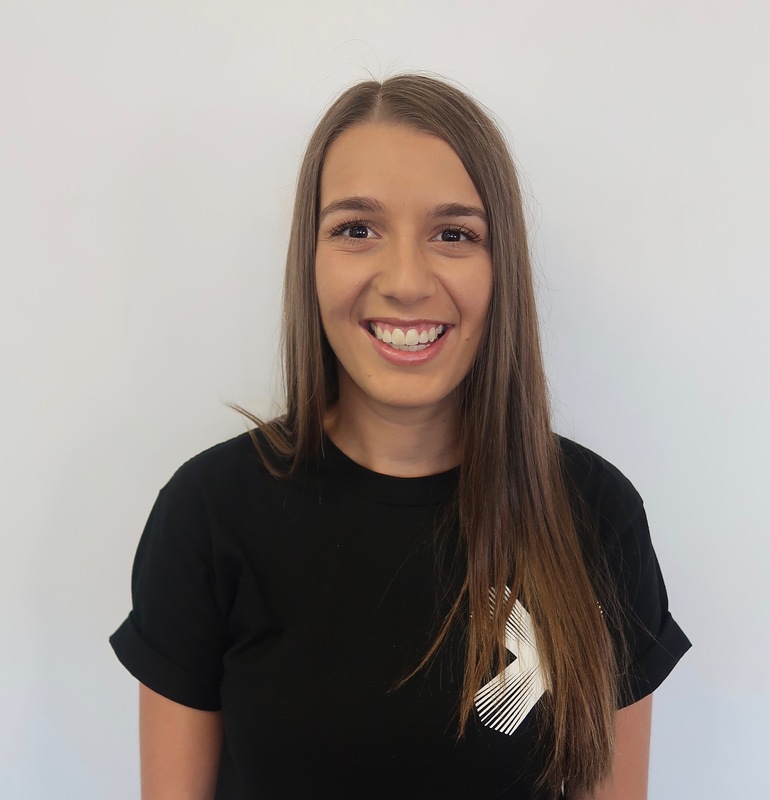 Aside from her work, she is also studying to become a physiotherapist at the University of Newcastle and so obviously is super excited to be a part of the Next Gen family to learn from the best physio’s in the business! PLAY: Been powerlifting since 2017 and in that time has completely fallen in love with the sport. Every day training to get bigger and stronger for more competing in the future! As well as lifting, Kim loves going to watch live music, travelling to new places and getting a good dose of Netflix in of an evening.